Kidneyleaf Buttercup, Littleleaf Buttercup, Ranunculus abortivus L.
Kidneyleaf Buttercup is a native, erect, branched perennial, growing on smooth but faintly ridged stems, 8-20 inches high. The leaves are both basal and stem and unlike the other 3 buttercups in the Garden, they are very different. 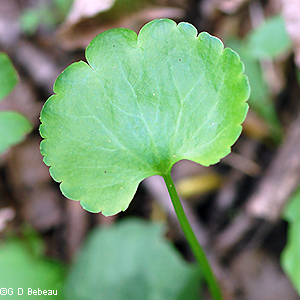 Basal leaves are kidney or heart-shaped, hence the common name. They are on long stems and usually undivided but sometimes the inner most leaves can be 3-parted. The tips have large rounded teeth. Stem leaves are alternate, few, usually stalkless, but deeply lobed with 3-5 oblong lobes, like many other buttercups. The inflorescence consists of a number of solitary stalked flowers rising from the upper leaf axils. The flower is 5 parted, but very small, 1/4 inch wide. 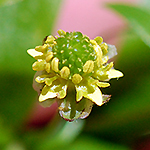 There are normally 5 recurved sepals that are longer and wider than the narrow yellow petals which are some of the smallest in the Buttercup family. In the center is a cluster of green carpels, without styles, surrounded by a ring of stamens that have greenish-yellow filaments and yellow anthers. Seed: Mature fruit is an oval cluster of dry achenes each of which has a very small curved beak. Buttercup seeds need some cold stratification for germination. Toxic: Buttercups have hazardous properties - see notes below. Habitat: Buttercups comprise about 275 different species. 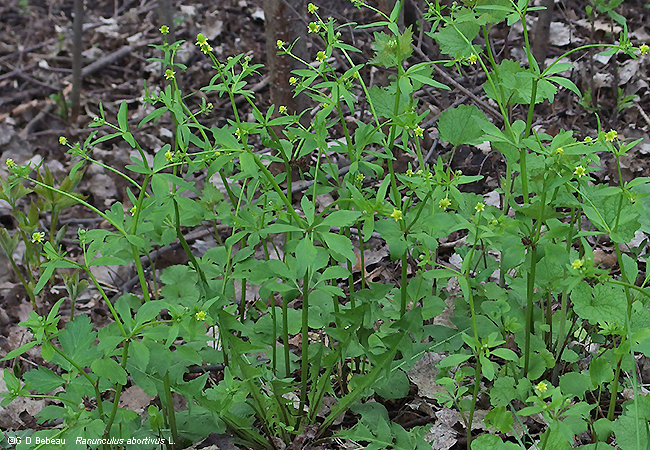 Kidneyleaf Buttercup grows in rich moist soil of woods, meadows, fallow fields and clearings. 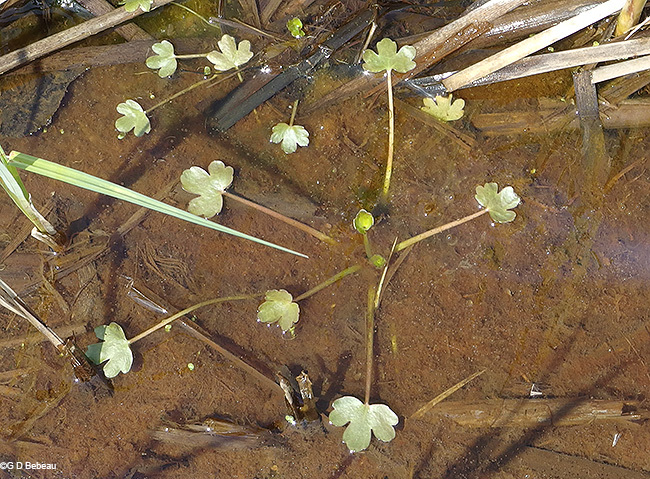 Plants can survive standing shallow water for short periods. It grows from a fibrous root system with the bottom of the stem sometimes enlarged. Names: The generic name Ranunculus, is from two Latin words, 'rana' meaning ' frog' and 'unculus' meaning 'little' and together they refer to a group of plants, many of which grow in moist places - like little frogs. The species, abortivus, is from the Latin aborior, meaning 'pass away' or 'aborted'. The use of abortivus is then usually meant to mean - 'parts missing' or 'showing arrested development' which may be a reference to petals of the flower that are quite small, but we are not certain if that is what Linnaeus had in mind. The family name of Buttercup, used to be "Crowfoot', hence the continuation of the 'Crowfoot' in many of the species common names. The author name for the plant classification, 'L.' refers to Carl Linnaeus (1707-1778), Swedish botanist and the developer of the binomial nomenclature of modern taxonomy. 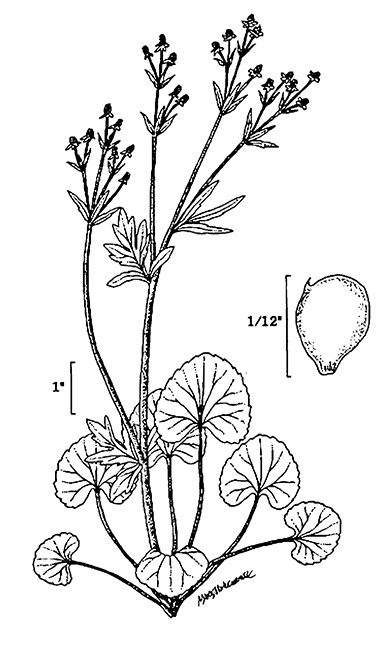 Comparisons: While the difference of basal and stem leaves of this species are unique, here are a few other buttercups for comparison: Cursed Crowfoot, R. abortivus; Swamp Buttercup, R. hispidus; Tall Buttercup, R. acris; Hooked Crowfoot, R. recurvatus. The flower of R. abortivus most closely resembles that of R. recurvatus. 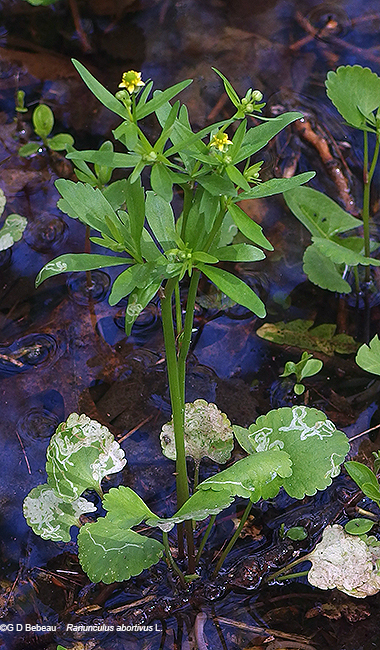 Above: Example of Kidneyleaf Buttercup. Drawing above from ©USDA-NRCS. Wetland flora: Field office illustrated guide to plant species. USDA Natural Resources Conservation Service. 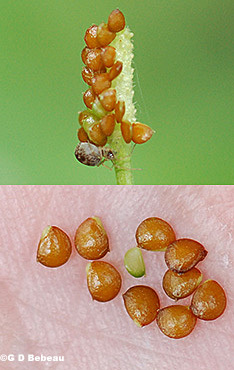 Below: The longer and wider greenish sepals are visible in this pair of photos. 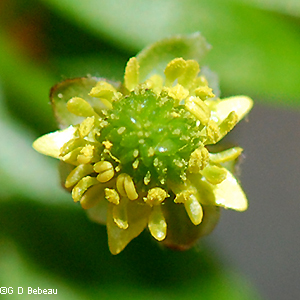 The green carpels in the center are surrounded by a ring of stamens with yellow anthers. The small petals are some of the smallest amoung the Buttercups. Below: 2nd photo - The stem leaves are deeply 3 to 5 lobed and stalkless, far different from the kidney shaped basal leaves (1st photo) which are on long stalks with coarse rounded teeth on the margins. 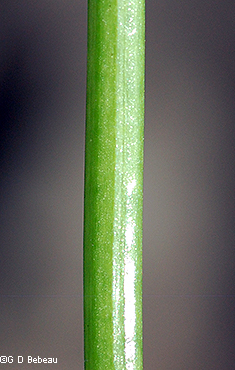 Below: 1st photo - The green stem is smooth but faintly ridged. 2nd photo - The maturing seed head and seeds. Note the very small curved beak on each seed. Below: A basal clump of leaves developing which submerged in early May. 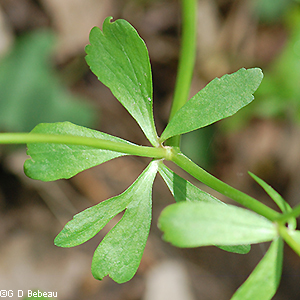 Notes: Kidneyleaf Buttercup is indigenous to the Garden area; Eloise Butler catalogued it on May 25, 1907. Martha Crone noted it in bloom in 1939 and listed it on her 1951 Garden Census under the name Small-flowered Buttercup. It has been listed on subsequent census reports. It is native to Minnesota, being found in all counties with a few scattered exceptions near the western border. R. abortivus is one of 16 buttercup species found in Minnesota. It is found throughout North America except in the U.S. states of OR, CA, NV, UT and AZ. Eloise Butler wrote the following about Buttercups: "A number of the early flowering plants are members of the crowfoot family [Ranunculaceae -in current times this family is now called the Buttercup Family], [such] as the anemones and buttercups. In the divided leaves of a crowfoot, as some of the buttercups are called, the early botanists saw a resemblance to a bird’s foot. 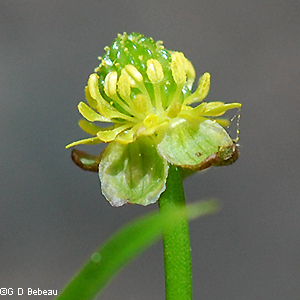 The buttercups of Minnesota are not so much in evidence as the tall European buttercup [Ranunculus acris L.] the pest of the hay fields - farther east.